Renaming your audio files can be a tough task. And the bigger your music collection, the tougher this task gets. The key is not only to find a way to edit multiple files at once to save time but also to make sure all the file names follow the same pattern. The latter is impossible to achieve without hours of tedious work with great attention to detail, and this is where software comes in. Unfortunately, the majority of relevant programs simply doesn't allow editing multiple files at once. mp3Tag Pro has a solution for both of these issues. Below are three easy steps to help you make your music collection more organized. Download mp3Tag Pro, launch the file and follow the instructions (there is also a one-click installation button). The free version of the program allows you to edit up to 50 audio files at once. Select the required folder from the 'Folders' list on the left. The list with files will appear in the main area in the center. To select all the files, click on the 'check mark' icon on the right. Click on the 'Rename files' button below the main area. 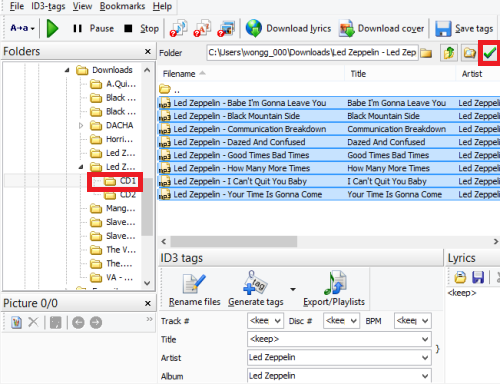 Bars with '<keep>' identify the information that is different for each file, while the 'Album' bar is likely to have the same value for all of them if the 'Artist' bar is the same too. In the new window that opens, you can generate names for the whole batch using the 'Format' area on the left. Symbols in brackets identify ID3 tags, such as track title, artist and album name and etc. The 'Format' bar is used to assign their order. The main window with the list of audio files shows the 'Before' and 'After' file names. Quick tip: to save space on your screen, you can also customize the main window by ticking the boxes in the 'Format' area. Click on the 'Rename files' button at the bottom, if you are satisfied with the result. Important note: Not all audio files that have been downloaded online have all the ID3 tags that are required to make this task quick and easy. 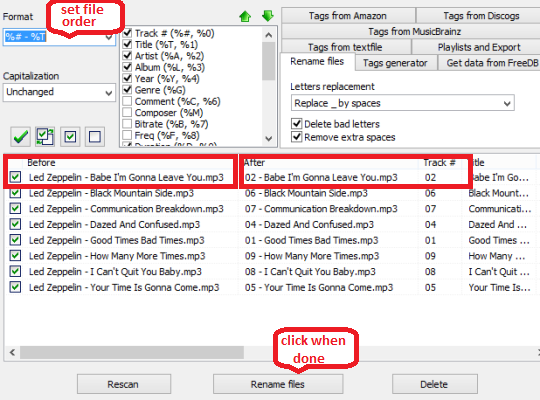 In case some important tags are missing, mp3Tag Pro has an feature that allows to download them from online databases. For more information, see this article:How Do I Get Id3 Tags From the Internet?